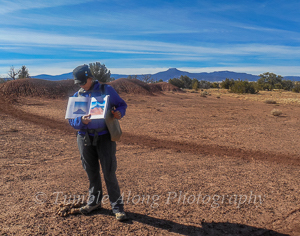 As we walked, Karen compared photos of O’Keeffe’s paintings and encouraged us to look for the subjects of the paintings. Some were easy to identify — others took a little more time. The area is an immense 21,000 acres. Karen has spent years studying the paintings and looking for the original areas in them. She has identified an impressive number of them. We walked about a mile through this terrain until we came back to the road. An adobe home sat to our right. This was Georgia O’Keeffe’s home. You can almost see her, paints and brushes in hand, climbing up the ladder leaning against the house, spending hours painting the Cerros Pedernal visible to the south. As we were headed back, we met one of the horseback riding tours and waited for them to pass before we continued our short walk to the van. 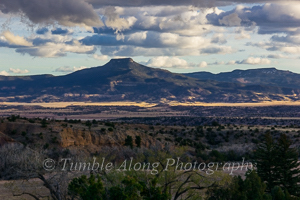 Ghost Ranch is both peaceful and breathtaking. When planning your trip to Ghost Ranch, do plan to take one of their tours — walking, bus, or horseback — or even all of them, as each is unique. Online reservations are best to guarantee one of the limited spots. There are sleeping accommodations available at different pricing tiers. Don’t plan on watching TV. Do plan on hiking, exploring, or taking part in one of their educational programs. A catalog is available for the next year’s season. You can sign up on their website (www.ghostranch.org). They host programs throughout the year plus group retreats. A definite place to visit is the Museum of Anthropology and Paleontology located on the ranch with fossils from the Triassic Period. There is just so much to see at Ghost Ranch — you should plan to spend a few days. Plus there are farm animals, hiking trails, spectacular views, a gift shop, and a coffee cafe. You may even get to see a movie being filmed. Postscript: In July my family visited the Science Museum of Minnesota for the Ultimate Dinosaur exhibition and Omni Theater production. What a thrill to find out that “Dinosaurs Alive!” was filmed at Ghost Ranch. If you get the chance to see this exhibition in your city or a city near you, don’t miss it. 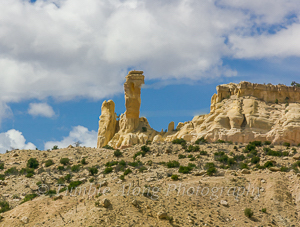 The movie explores the excavation sites where they found the dinosaurs and fossils displayed in the museum at Ghost Ranch.